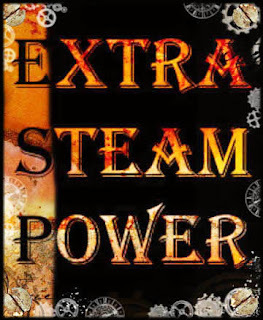 Hello and a very joyful welcome back to another inspirational Extra Steam Power (short "ESP") post! 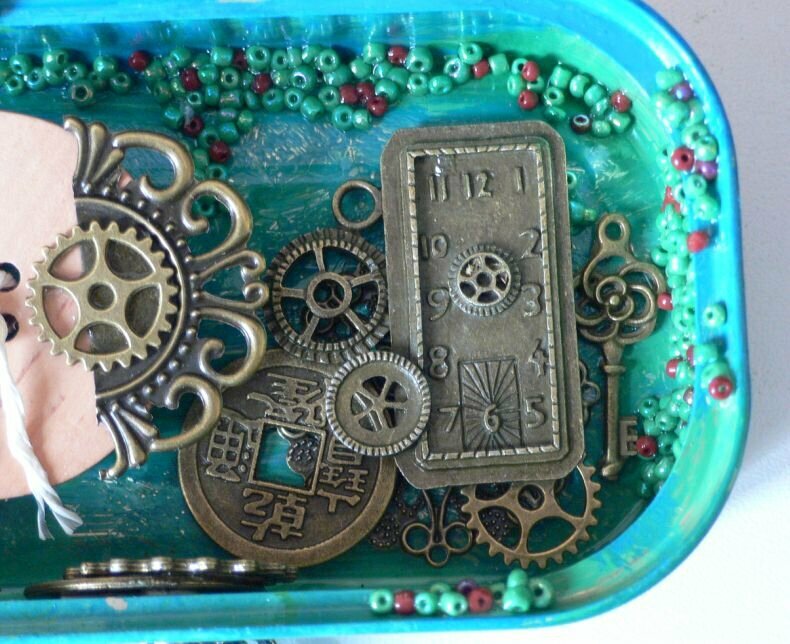 This time Brigitte from La maison de coutureuse has done her very unique magic on an old tin! 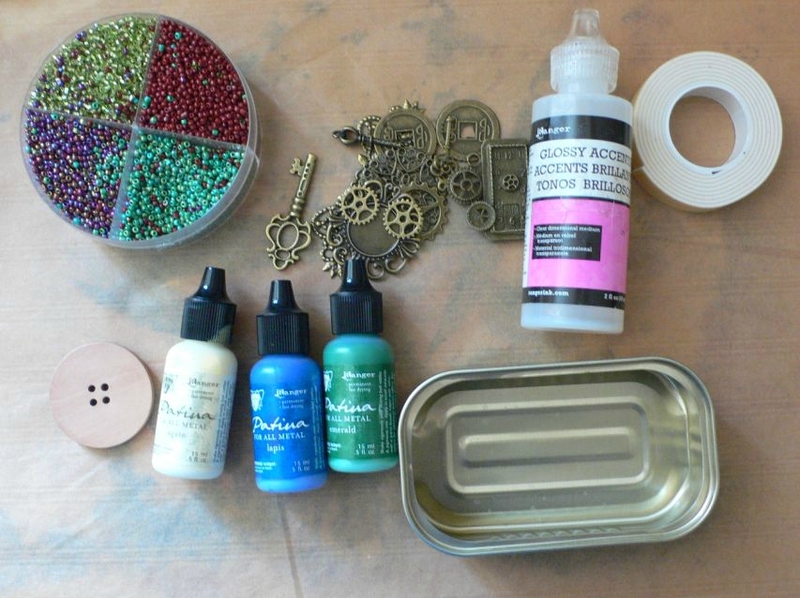 I LOVE altering tins and hers looks absolutely brilliant! 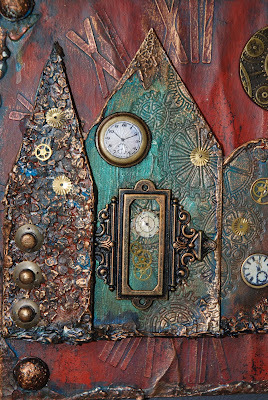 But before I offer you this gorgeous steampunk eye candy I want to remind you that there are still three more days left to enter our actual "The Ravages of Time" challenge and by doing so get eligible for a fab prize win sponsored by Inspiration Emporium! But now the stage is yours, Brigitte! Applaus, applaus, applaaauuuusssseeee! (doing my Kermit the Frog waving-about). peignez la boite en mélangeant les 3 couleurs, intérieur et extérieur, laissez sécher. Collez des perles ici et là avec le glossy, laissez sécher. passez un morceau de fil dans les trous. 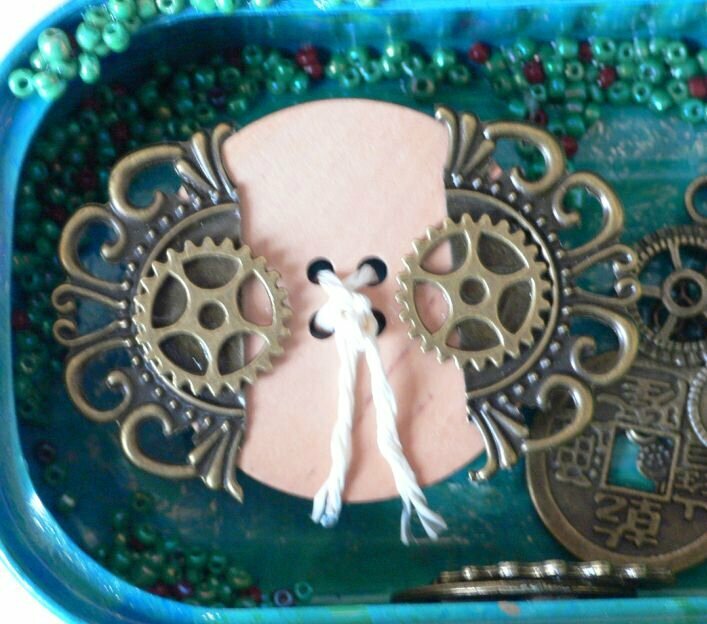 finish with a piece of thread in the holes. la dernière breloque est collée sur du double face épais. Collez le bouton sur de la mousse puis collez dans la boite. nouez le fil à l'intérieur de la boite. Cachez le noeud avec 2 breloques collées dessus. Au dos collez une dernière breloque qui servira d'accroche. 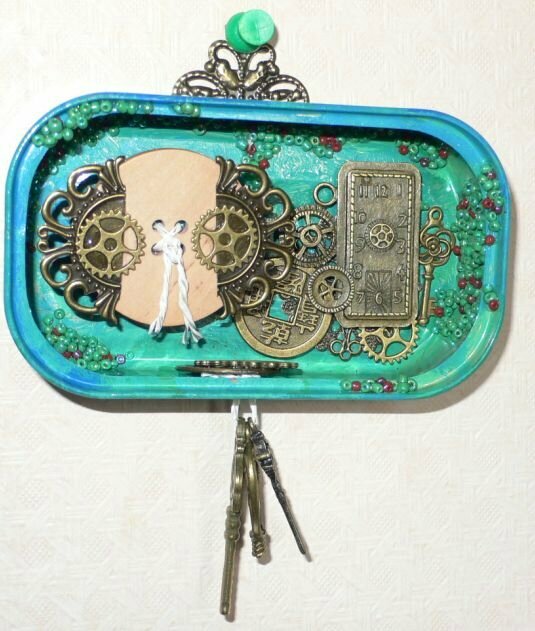 Glue a charm to the back of the tin to use as a hanging device. Et voilà, bon appétit !!!!!!!! 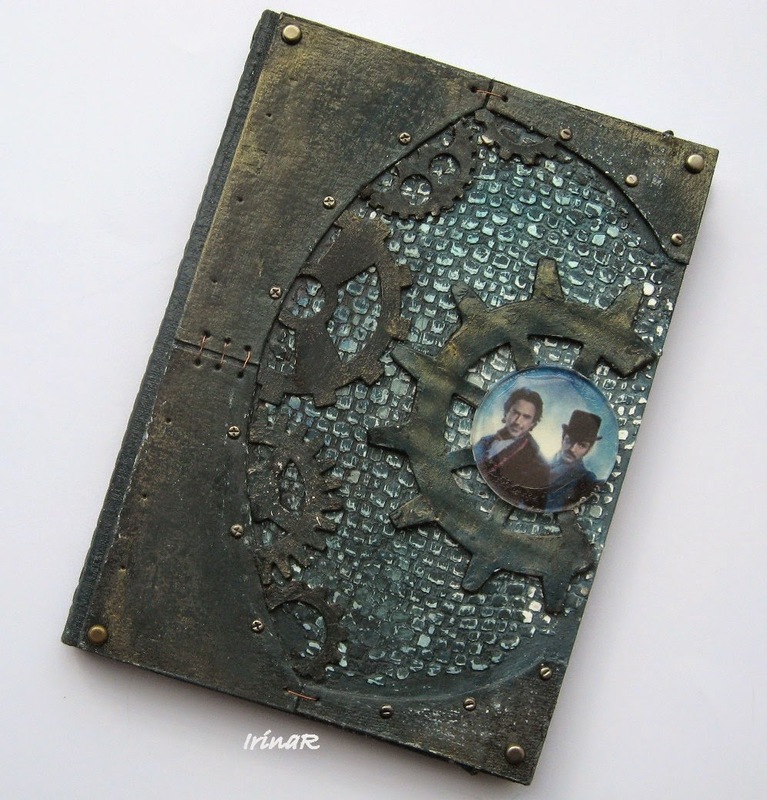 Servus and a heartfelt welcome to the start of a brand new feature over here on our challenge blog, dear arty steampunk friends and crafters! From time to time we will share some additional steampunk projects done by our DT that are not related to the actual challenge theme - simply to provide you with additional inspiration and share additional steampunk fun and joy. 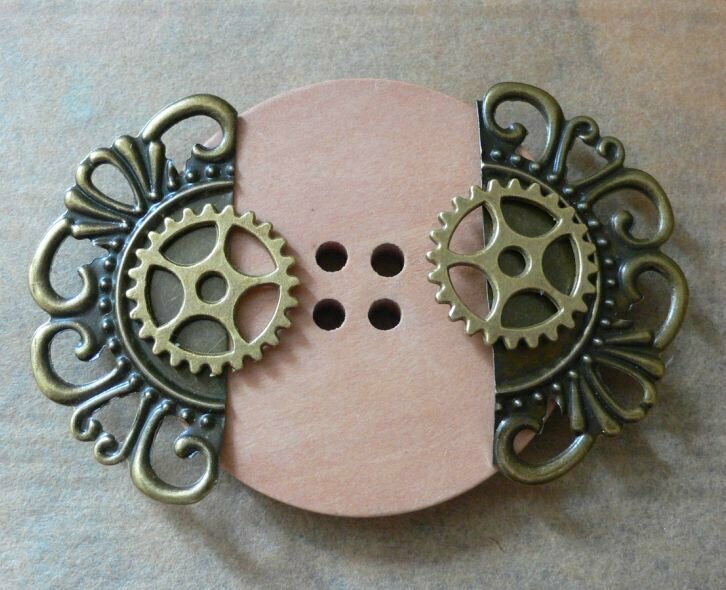 We want this little steampunk corner (and our new facebook group) to become a spot where you will always find new ideas and inspirational fuel for your own steampunk art! 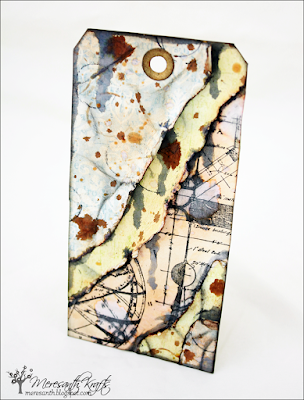 Our actual challenge "The Ravages of Time" is open until the end of the month. To find out more about it click the badge at the top of our side bar that leads you to the actual challenge. If you want to check out the makes of team B, just scroll down to the previous post. 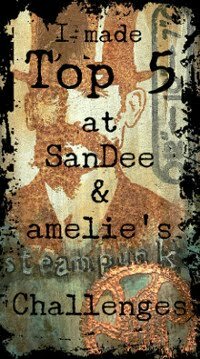 Welcome to the first Extra Steam Power post at Sandee and amelies Steampunk Challenges. Everyone should watch Andy Skinner videos - every time I do I always rush off to try out the techniques he so brilliantly does. 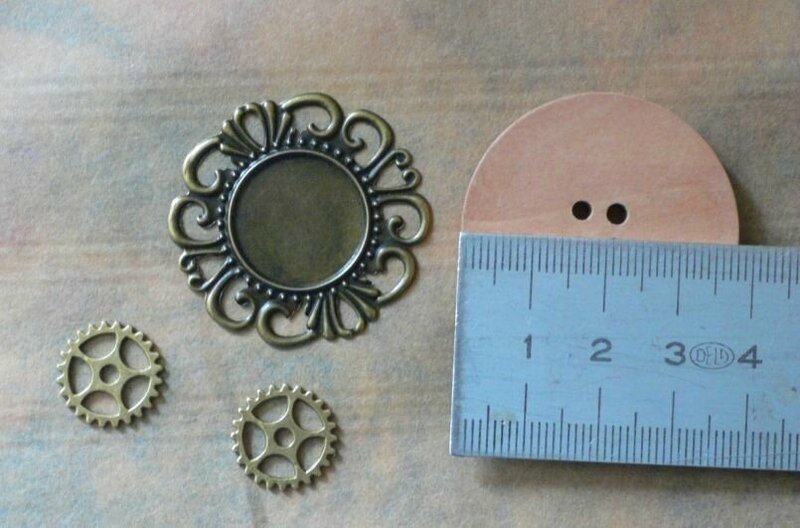 Usually when I watch demo videos I never have the items that are being used and I have to try and find a substitute (or impatiently await a craft order!) 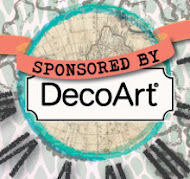 but this time I was in luck...I had asked my wonderful friend Claudia to suggest some Decoart items that she thought I would love to use and I ordered them....and of course the items Andy used were on the list!... and they had arrived the day before...how is that for good timing?! I really do recommend that you watch the three videos....I will be giving an explanation of what I did with just one of the techniques...but you really should watch what Andy does. 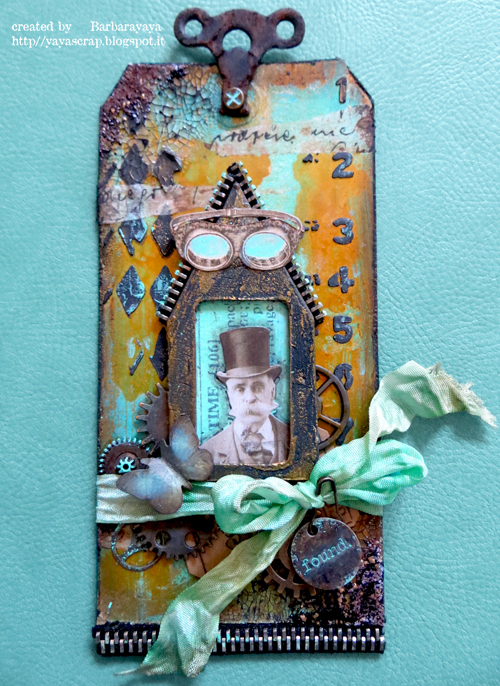 I spent a whole morning having a great time playing around with all three of the techniques (and variations of - lets face it not everything goes to plan all the time - but even mistakes can be tweaked) and so I ended up sitting there with about six future projects - all rusted and ready to be put together. Andy used embossed chipboard for this rust technique. 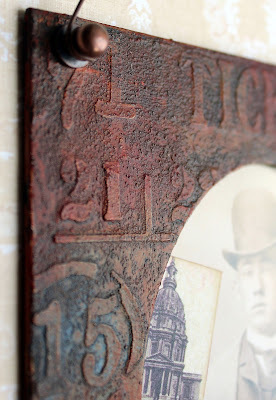 I didn't have any, so I got this cardboard photo frame and covered it with texture paste through an Andy Skinner stencil -I adore this stencil!!! After leaving it to dry I then followed Andy's instructions to rub some Sand Texture Paste on it. I love any crafts that get messy so this was wonderful. I left it to dry and then followed Andy's instructions to mix Paynes Grey with white - I chose to go slightly lighter then he did in the demo...I intend to experiment with different tones and see what happens...I also want to see what effects applying more of the sand texture paste does...this technique has so many possibilities! Then a wash of diluted Paynes Grey (I need this paint in bucket size!) I brushed the wash over and then loaded the brush with the wash and dabbed it over the frame to form darker patches. When this was dry (and already looking really gorgeously grungy - the texture paste is amazing!) 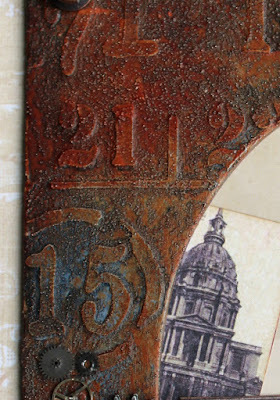 I began to cover it with Quinacridone Gold....I love this paint...I had used it before on my own rust techniques (that sadly could never match this for texture and realism) but it transforms into glorious shades of rust when brushed over Paynes Grey! It is magic!!! I wanted the rust to be patchy...not a dense colour. So I decided which areas I wanted the rust to be the lightest and just very gently dry brushed over the parts, leaving parts of Paynes Grey uncovered. And there it is.....I will certainly be using this rust technique over and over again...it was so much fun and very easy! Thanks so much for being here! 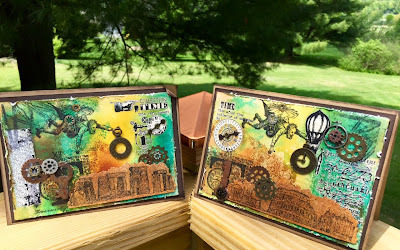 I hope I have inspired you to try out some Steampunk creations! 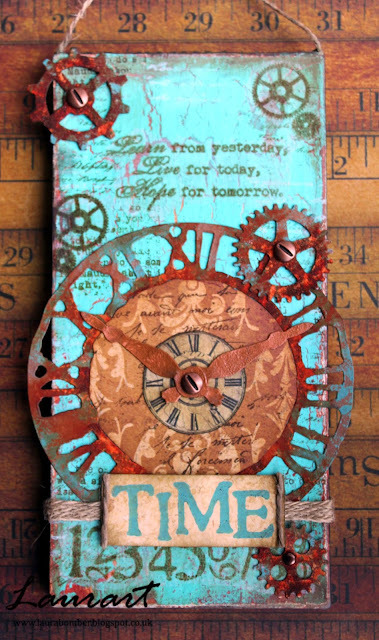 Our challenge this month is 'Ravages of time' and rust just fits in so well....why not get a bit rusty and join us? Servus and welcome to the mid- month reminder of our actual challenge "The Ravages of Time" which asks for aged and worn looking effects and designs...maybe a little (or a lot of) rust, some crackle here and there or some peeled paint or wallpaper creations? Patina, lichen, corroded metal,....well, the list is far from being complete yet but I am sure you will find your personal favourite for this theme (and hopefully enter a project to our challenge before the end of this month)! We already had a great bunch of awesome entries and are gobsmacked by all the talent out there! And we can't get enough of it! Seeing a lot of wonderful projects entered to our challenges really is the most wonderful reward for all the love and labour that's being put into DT work, you know? So let me say a huge "THANK YOU SO MUCH!" for playing along and for creating all the amazing art you enter with our challenges! 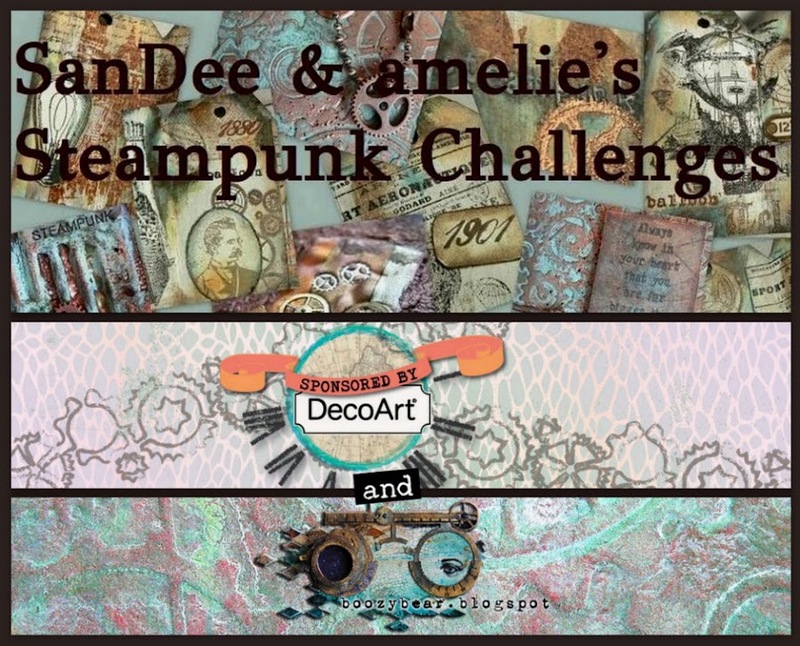 The ladies from team B have once more risen up to this challenge and created another fab bundle of inspirational goodness for you! But before I show you their creations just let me announce this month's prize sponsor which is once again lovely Joy from Inspiration Emporium, who are giving away a generous $25 voucher for shopping with their great online store! Thank you so much, Joy! But now on to the makes of team B! If you want to learn more about their projects just visit their blogs (by clicking their names) - and if you have a spare minute maybe leave them a comment to show them some appreciation! I am sure they will be very happy! 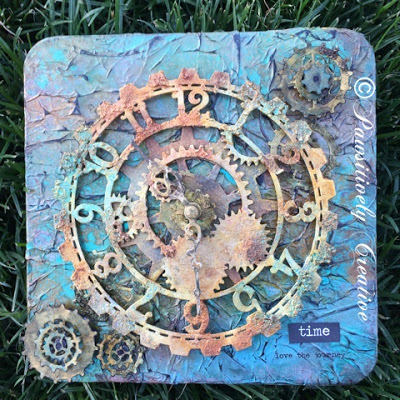 A challenge that is music to my ears...peeled paint and patina tinged rust was the inspiration for this weather worn creation and I loved every second of making it! 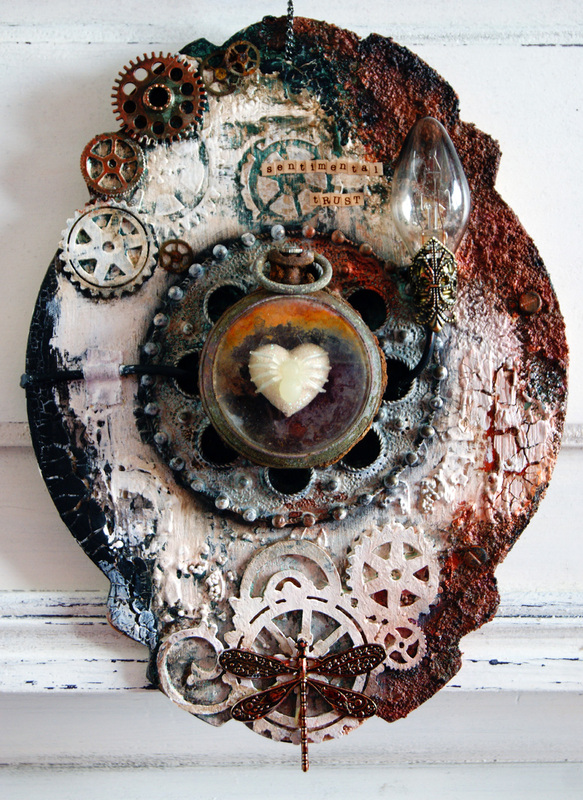 it is something special, even though already the teeth of time has gnawed on it. My piece is also like SanDee's inspired by Andy's work with my slant on it. I went for the time worn look with patina's, rust & decaying rust. I knew I wanted to try my hand at doing a patina effect. I came up with this technique through trial and error and lots of sprays! 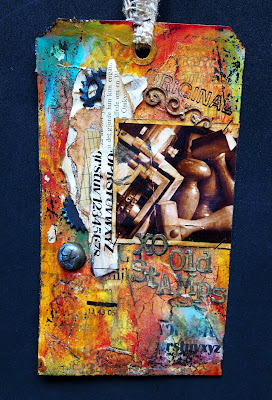 This altered box was ravaged by paints, gesso, inks and so much more! 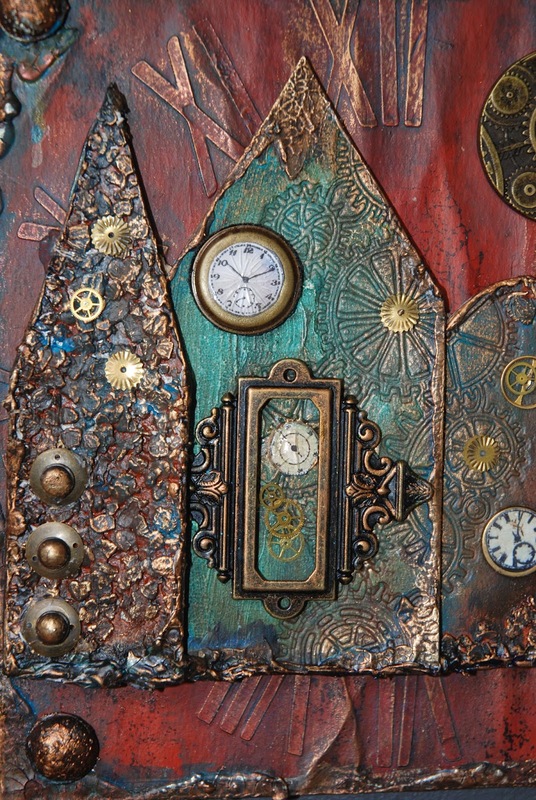 Texture pastes played a huge part in making this Ravaged Clock! If you haven't seen the makes of team A yet, you find them over HERE. Our challenge is open until the end of the month and you can enter up to three different projects. 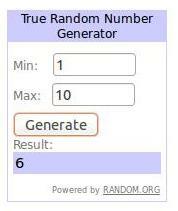 Each single (and proper) entry counts as a vote for the prize draw. Prize winner and top5 will be announced on a Saturday as usual - but this time on July 11th so there's enough time for the team to vote. You find the inlinkz collection at the bottom of this post or also with the post from the 1st of this month when we started the challenge. 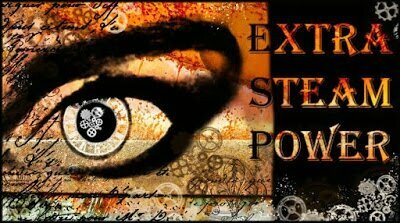 Thank you for all the wonderful entries for our "Eyes Tested!" challenge - once more you showed us loads of imagination and creativity and chosing our Top5 was - once more - hard. Yay! 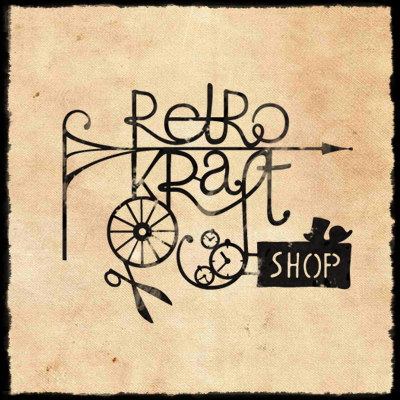 Huge congratulations, nate, and please, contact me via email (the address can be found at the side bar) so we can send your Retro Kraft Shop voucher to you. All details about the challenge can be found HERE (or you get to the actual challenge by clicking on the badge on top of our side bar). I also would like to invite you to check back on June 15th when we are going present the makes from team B alongside this month's prize sponsor! 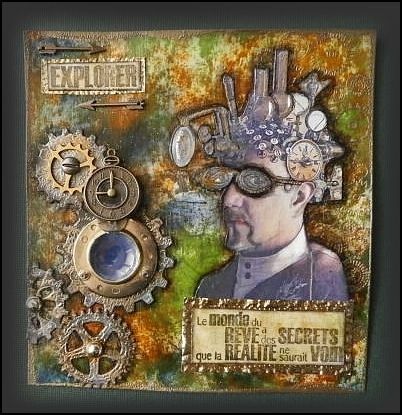 Servus and welcome back to our little creative spot where we try to offer you some inspirational challenges with a Steampunk/Vintage twist! Thinking of peeling wallpapers, rust in all its glorious forms of appearance, peeled paint, crackle, patina, weathered wood,....show us your interpretation of this theme and enter up to three projects... and by doing so get eligible for a lovely prize from one of our generous sponsors (each proper entry counts as one vote). The sponsor for this month will be announced alongside presenting the makes of team B on June 15th. The prize winner and Top 3 to 5 from our May challenge will be announced on Saturday, 6th June. So make sure you come back and check if you are one of them! But now on to the makes of team A, who have once more outdone themselves on providing you with wonderful projects to fuel your inspiration! For more details, please, visit my lovely teamies' blogs (for enlarged view click on the images). 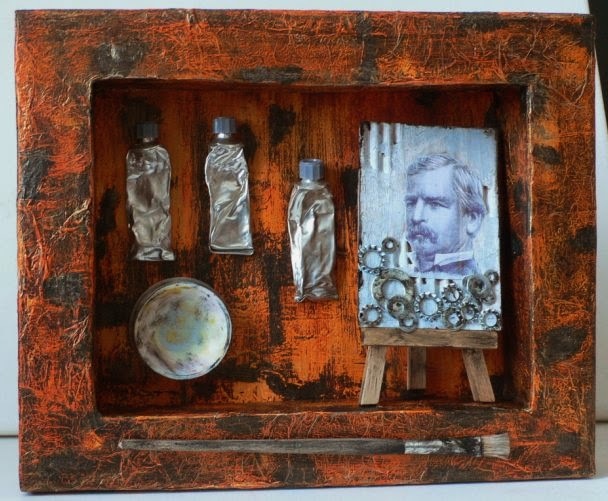 is an assemblage made with crackle, patina and rust. I have photographed my old company stamps as I found at a flea market. And I think they should be used on a large manilatag. Look closely - it's not a tag! 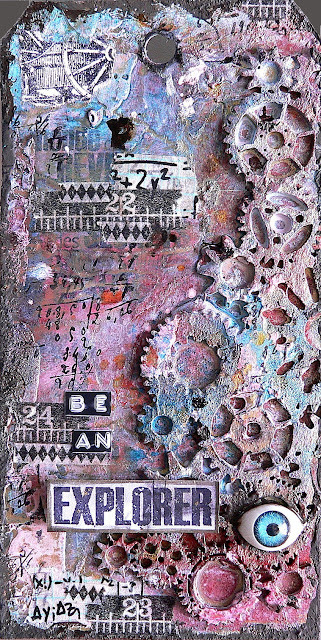 What could show "The Ravages of Time" better than time itself. That is why I created a clock. I loved to play with this Mixed Media technique and DecoArt Products - so much fun and just amazing Products. By the way I got inspired by Andy Skinner. Really hope you like it. More details and a step by step of my Project can be found on my Blog. 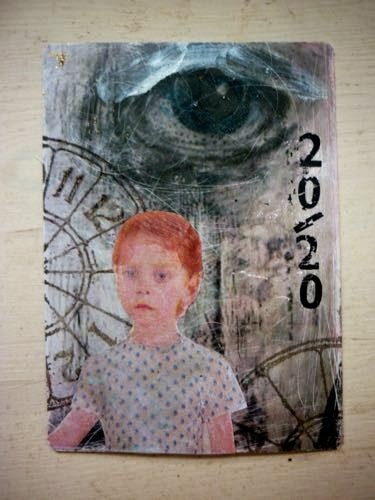 I needed to make birthday cards for my adult sons, and I thought as another year passes in their life journeys, maybe they are feeling the "ravages of time". Details are posted on my blog. I hope you are as gobsmacked by my teamies' creations as I am! They really put such a lot of imagination and effort into their makes (which makes me the proudest challenge blog owner you can imagine). The challenge is open until the end of the month (please remember our blog has Central European Time!) 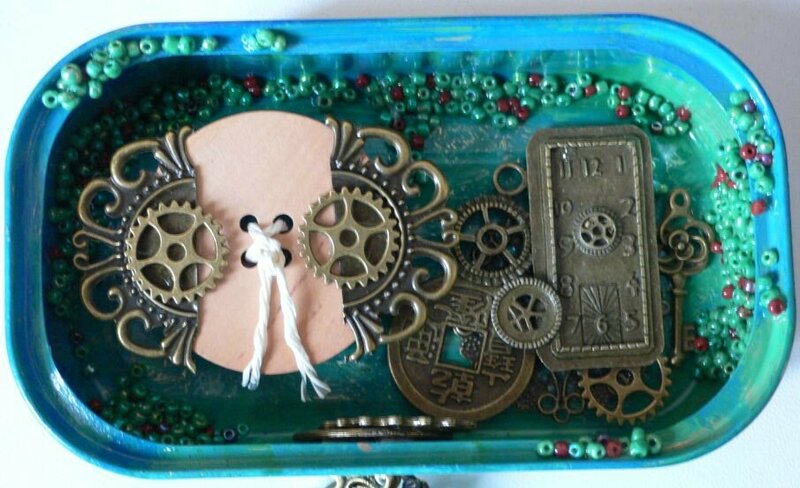 and we are looking forward to seeing your timeworn and "ravaged" creations soon!